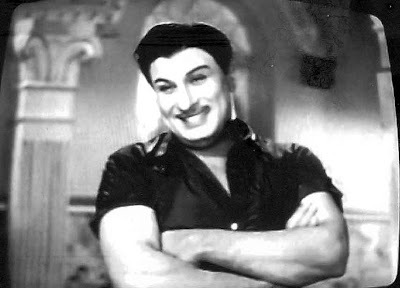 MGR came to Movie world from Drama Stage in 1935 and acted to the end of June 1977. Please notify any errors in date of release. 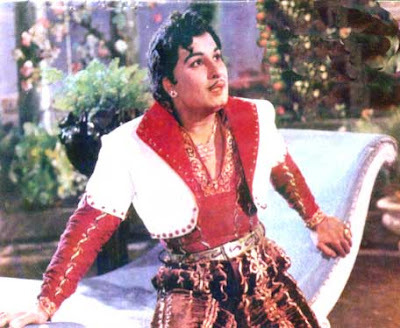 MGR posing as King in "Nadodi Mannan"
MGR Fans are asked to check the release date of some movies which are not available to me. The bold letters indicate Silver Jubilee movies. 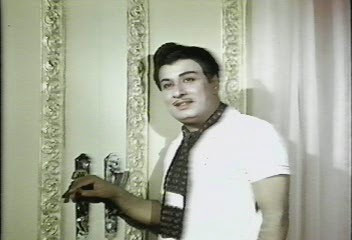 Out of 11 silver jubilee movies 9 movies MGR was the Lead Artist. Thank you for your list. Please share with me where can I download MGR's DVDRip full movies (not torrent file). Suresh Thanks for the comment, and regarding the DVD rip, sorry I do not know. nice work,really appreciate.i am also mgr fan. 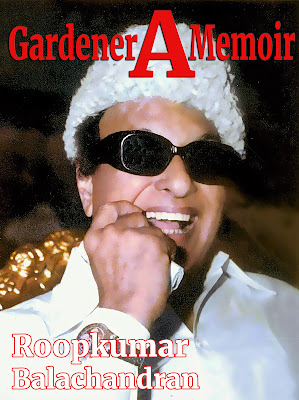 Mgr died in 1987 AS CM but how come his new movie released in 1990? Mr.Vaithisvaran thanks for the visit and writing the comment. 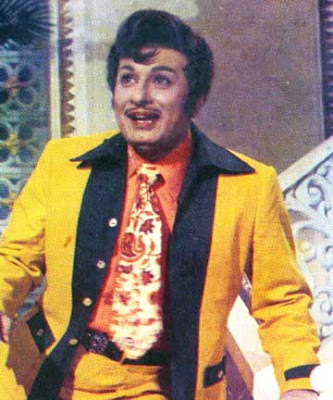 As you have mentioned that Puratchi Thalaivar MGR died in 1987 how a movie could have released after his death? His last movie released in 1978 January 14th. 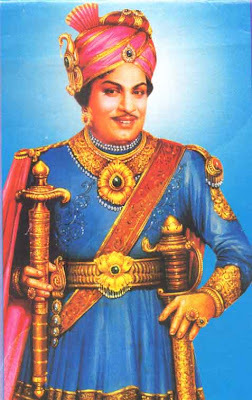 Then after been elected by the People of Tamil Nadu and remained the Chief Minister till his last breath never acted/faced the camera in movies after June 1977. Regarding the question two movies Avasara Police 100 and Nallathai Nadu Ketkum were released in 1990, both the movies are unfinished MGR lead role movies. 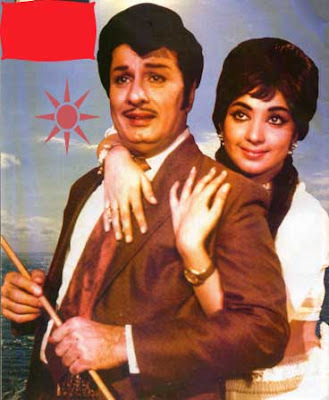 Baghkiaraj used "Anna Nee Yen Deivam" MGR portion & including his character, finished and released the movie as Avasara Police 100 and likewise Jeppiar used Nallathai Nadu Ketkum some MGR portion and released the movie. The movies are available now as DVDs and you can also watch the movies in youtube. 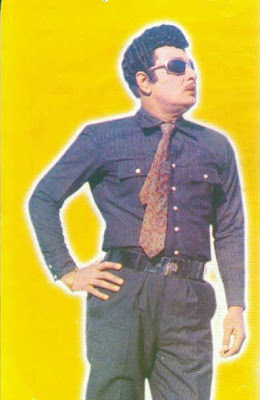 In Avasara Police 100, MGR footage runs for 25 minutes with two songs. 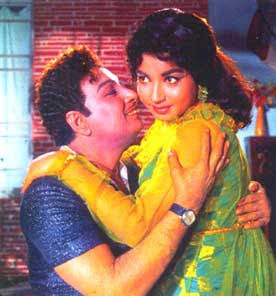 In Nallathai Nadu Ketkum MGR scenes lasts for 9 minutes. Excellent work.You can post collection particulars of hit films of MGR.young people can know the vasool power of MGR on those days(Ticket rate is 31/54/66 paise and rupees 2 is the max ticket charge. Thanks K.V.Nathan sir for the comment. Left release dates are as follows: Iru sagodharargal-10-09-1936sagodharargal-10-09-1936. Thanks K.V.Nathan sir for giving information about the date of release. In couple of days the post will be updated. Even today three letter word MGR rules the people and his movies attract many.His principles suits even today. Thanks Hrithik Shah for the comment. Gowtham Ranjith Thanks for the comment. 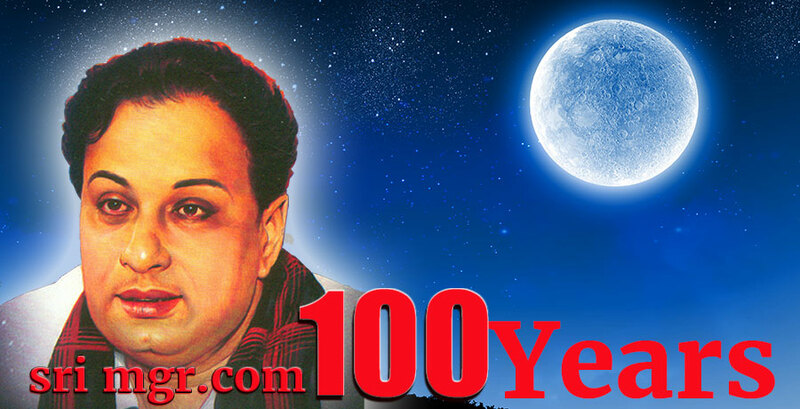 Please contact Mr.Thangavel of UK Golden Movies regarding the full collection of MGR mp3 songs. 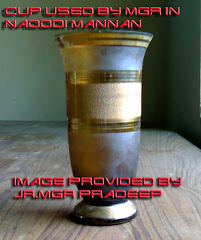 Sir... just want to know why Sirithu Vazha Vendum and Ninaithathe maddipavan full movies are not on you tube. Sirithu vazha vendum is not included in HIS movie list as well. Thank for the comment MGR fan from South Africa, it would be good if you have left your name. Regarding the movies Ninaithathai Mudipavan and Sirithu Vazha Vendum which are not uploaded in youtube maybe copyright reasons. Sirithu Vazha Vendum is in the movie list which comes after Urimaikural and it is 125th movie of our Puratchi Thalaivar. Thank you Mr.Mogashvani Gilbert for replying. As of Anbe Vaa the movie is not uploaded in youtube at present due to copyright problems. Some years back I happen to see the movie in youtube. If you notice even we cannot add one clip of Anbay Vaa in youtube sir. I faced that problem years back so I stopped uploading the scenes which I took from a cinema theatre during re-release. Thank you for your prompt feedback. Hoping that the copyright will be lifted sometime in the future so the movies I have mentioned become accessible. pay a visit this site, it consists of helpful Information. It was k bhakyaraj movie, where he added some scenes from mgr movie 'Anna Nee En Theivam' which was made when mgr was alivealive, but not released.